High quality denim shorts for kids that can we worn in all weather. Best quality cloth and stitching at cheapest prices. Our company has enough experience in this line of work of manufacturing, supplying and exporting a wide array of high quality Denim Stretch Jeans. Our range also includes a vast array of Denim Designer Stretch. 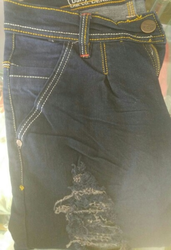 These Stretch Jeans are available for our clients at a very commendable and economic range of prices.